As much as we all would prefer otherwise, so often in a mother’s life do we hit an emotional wall with our children. It happens right around when they begin high school and is often so hard to deal with. They become unresponsive to them. Seemingly less sincere. Disinterested in what you have to say. They almost feel like they don’t love you the same way they did just a few years ago. While it can be rough to deal with, luckily there are ways to reconnect with your children as they move through their teenage years, which is what the focus of this article will be about. It will take adjusting how you interact with them, but the result is more responsive and loving child in the short term, and more importantly, a stronger overall bond that lasts beyond your child’s teenage and high school phase. Sometimes it just feels like you’ve lost touch with your children once they become teenagers. This is often where parents immediately go wrong. And the bad part is that the longer you keep trying to insert yourself into your child’s life, the further apart they move from you. Most kids at this age want very little to do with their parents, especially when they are around their friends and peers. If your child is not like that, then you are lucky. Otherwise, it is best to avoid being overly affectionate to your children. And don’t pry about their daily lives too much either if they don’t want to share. Please note however, that the implications for interacting with your children are wildly different when interacting them in public compared to. in private. Your child will typically be a lot more responsive when you are in private places such as in the home, again assuming you don’t pry too much. But take a similar question such as “how was your day” and ask it in public and your child will often respond a bit more coldly towards you. The key is to know your child and how they respond to you in different situations and adjust accordingly. By this, I really mean listen to the small things they mention. If they suddenly are no longer on good terms with their friend and they mention it to you, be sure to not just simply forget that information. The first thing to do is to use that small tidbit of knowledge to drive the conversation further. This is a simple way to take what your child is giving you and really get to know them, by talking about something that they want to talk about (we know that they want to talk about it because they brought it up in the first place!). Attentively listening to your child is a great way to show that you really care about them. The second thing to do, and one that parents often fail to do, is to follow up on that topic of conversation a few days later. Use it as a springboard to drive another intimate conversation with your child. And just the fact that you remembered something that was so seemingly small and insignificant will make your child appreciate you more. They will respect you and see you as a companion that they can confide in more and more. Children will make mistakes, and it is a part of life and growing up. It’s something we’ve all been through. However, as much as possible you should not berate your child for anything that is not too serious. Things such as coming back home after curfew, or even not telling you where they’ve been are good examples of situations where you should not berate your child. Doing so will only widen the gap between the two of you even further. Note that this doesn’t mean just let them off the hook without any confrontation. But it does mean approaching the confrontation in a different way. Excessively scolding or berating your child will only make things worse. First off, you should always show concern for their well being, but don’t raise your voice too much when doing so. You should make it very clear that they had you worried or that you could not sleep, whatever the case may be. Make sure that they understand where you are coming from and don’t let them brush it off. Once you’ve done all that, you can firmly scold them and have a frank conversation to ensure that they don’t do it again. If they aren’t listening for whatever reason, instead of raising your voice even louder, express your discontentment with their response and make it clear for the foreseeable future that you want them to change their behavior. Eventually they will listen, and it will come without the unnecessary berating that pushes your child even further. 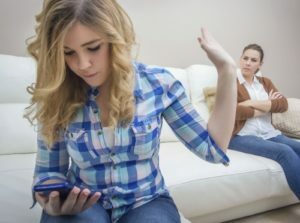 Of all the various aspects associated with parents, the one that teenagers probably hate the most is when their parents assert their authority too much. This is instilled mostly in high school with teachers becoming much stricter than they were in middle school. What that means though is that your children do not want that same amount of authority to be taking place at home. In fact, such authoritarian parenting can lead to long-term psychological and behavioral problems with your child as they grow older, which no parent wants. Now, while you can’t be completely lenient with them, a fantastic way to avoid the negative stigma that often comes with mean high school teachers is to compromise. If they are playing video games and you need them to go to sleep, don’t necessarily force them to quit the game. Gently tell them 20 more minutes or whatever is reasonable. And be sure to justify why you need them to sleep and explain that you want what is best for them. Explicitly explaining why you make certain decisions will help them understand that you are coming from a place of love and compassion. Keep in mind that you should still maintain a certain level of authority over your children. Just do so in moderation and compromise with them the rest of the time. The Teenage Years are Just a Phase! Even if you follow all of our tips and you feel like your children simply aren’t warming up to you in the slightest, just remember that this is a phase for them that will eventually pass. While years of a seemingly disjointed relationship with your child may feel agonizing to you, keep using our tips throughout. If not, you run the risk of your children permanently turning away from you, even after their teenage phase ends. No matter how your child responds during these years, if you can tread through this period relatively unscratched, your child will love you just as much, if not more so once they’ve matured into full grown adults. Follow these tips and you will be in good hands. Good luck!